Since the end of the civil war in 2009, Sri Lanka has been booming even as the rest of South Asia region has lagged. 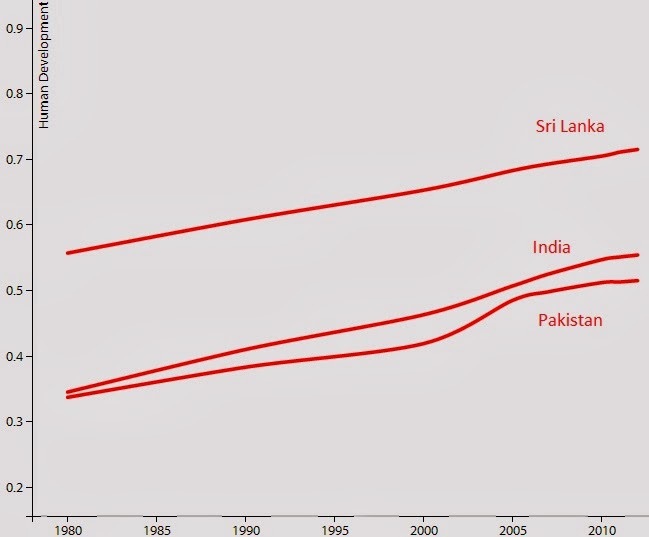 Sri Lanka's per capita income has quintupled over the last two decades from about $700 to $3500, significantly outperforming all other South Asian economies. During the same period, Pakistan's per capita GDP has increased from $500 to $1300 while India's is up from $400 to $1400. In addition to its high per capita GDP for the South Asia region, Sri Lanka has also excelled on Human Development Index (HDI), a key indicator of social development assessed each year by the United Nations Development Program (UNDP). Sri Lanka has the fastest growing economy with the highest social indicators in South Asia region. Its economy grew at 7.2% last year and it is expected to post 8% growth this year. With a literacy rate of 91% and life expectancy of 76 years, the UNDP ranks it among countries with high human development. It has achieved this progress in spite of a 26-year-long violent insurgency by the Tamil Tigers (LTTE) which it successfully ended in 2009. 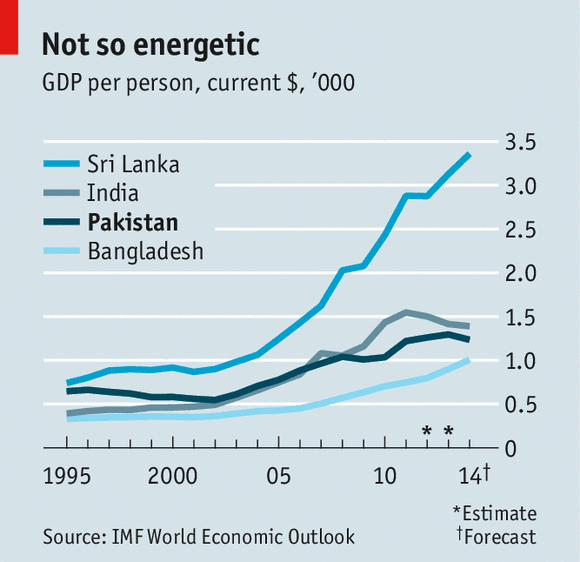 By contrast, both India and Pakistan continue to lag Sri Lanka in terms of both economic and social indicators. India's economy has slowed in recent years. India's per capita GDP has shrunk in US dollar terms this year, significantly reducing the gap with Pakistan whose GDP has also seen slow growth since 2008. India suffers from low levels of human development with a rank of 136 among 187 countries. Pakistan ranks even lower at 146. Pakistan's per capita GDP remained essentially flat in 1990s before doubling in years 2000-2008 on Musharraf's watch when Pakistan joined the ranks of middle income countries with per capita income of $1000 or more. Pakistanis have seen a very modest growth in their incomes since 2008. While India's human development is still low, it has continued to make steady progress in the last two decades. Pakistan's human development progress briefly accelerated in years 2000-2007 on President Musharraf's watch. Pakistan's HDI grew an average rate of 2.7% per year under President Musharraf from 2000 to 2007, and then its pace slowed to 0.7% per year in 2008 to 2012 under elected politicians, according to the 2013 Human Development Report titled “The Rise of the South: Human Progress in a Diverse World”. Going further back to the decade of 1990s when the civilian leadership of the country alternated between PML (N) and PPP, the increase in Pakistan's HDI was 9.3% from 1990 to 2000, less than half of the HDI gain of 18.9% on Musharraf's watch from 2000 to 2007. There is much Pakistan can learn from Sri Lanka's record on human and economic development as well as fighting violent insurgencies. It is especially important today as its economy and education suffer in the midst of a growing Taliban violence that threatens the very existence of Pakistan. Can Pakistan Learn From Sri Lanka to Defeat TTP? Will "Last Chance" Talks With TTP Succeed? HWJ: "India/Pak Literacy 1950: 19%"
On page 193, UNESCO report shows Pakistan's literacy rate was only 14%, lower than India's 20% in 1950. You have great praise for Musharraf, but go further back and Pakistan was comparable to SRI LANKA! Anon: "You have great praise for Musharraf, but go further back and Pakistan was comparable to SRI LANKA!" Read the chart of per capita gdp and HDI growth included in the post and pay attention to the slope in different decades. You'll notice that the slope was much steeper during Musharraf years than in the years before or after his rule. The worst damage to Pakistan's economy and human development was done in what is considered the lost decade of 1990s and then again in the last 5 years. So according to IMF outlook,the Buddhist Majority Srilanka and Buddhist Majority China are doing better then Hindu Majority 'SuperPower' India while 'FailedState' Pakistan is still neck-n-neck with 'SuperPower' India, tsk tsk tsk. "So according to IMF outlook,the Buddhist Majority Srilanka and Buddhist Majority China are doing better then Hindu Majority 'SuperPower' India while 'FailedState' Pakistan is still neck-n-neck with 'SuperPower' India, tsk tsk "
^^RH: "On page 193, UNESCO report shows Pakistan's literacy rate was only 14%, lower than India's 20% in 1950"
This is to be expected. Undivided Punjab was about the overall average for British India, but Muslims had lower literacy than Sikhs/Hindus. So after partition the average literacy in West Punjab would have collapsed due to exodus of more literate Sikhs/Hindus and arrival of less-literate Muslims from East Punjab. Given than Punjab is 60% of our population, any change in Punjabi statistics affects our overall National rates significantly. This is the most likely explanation for why Pakistan has a lower rate than India in 1950 after the partition transfer. Ramesh: But Pakistan is already a 'failed state' what is "Superpower" India's excuse? And why is a non-hindu non-super power like Srilanka doing better then 'Superpower' smart-hindu India? Perhaps like Urdu rate of growth Superpower India is going back to it's traditional Hindu rate of growth,fitting. India is 20% non Hindu and Sri Lanka is 20% Hindu !! Make your comments using facts please! I am Sikh and Muslim living in India by the way! World's biggest Weapons buyer India losing more soldiers in Red Corridors than J-K, One Indian solider dies three days.Indian born Maoists are killing more Indian soldiers then all'cross-border' terrorists combined. As I have always said, "Savings, savings, savings". This is the mantra that Pakistan should be repeating while it clicks its development-beads. KARACHI (AFP) - Pakistan recorded five per cent growth in the first quarter of the current fiscal year, the central bank said on Friday, beating its target and almost doubling the figure for the same period last year. The State Bank of Pakistan's data for the early months of the financial year began in July 2013, said GDP grew by 5.0 per cent, compared with only 2.9 per cent in the first quarter of the last fiscal year. Nuclear-armed Pakistan, plagued by a bloody, destabilising Islamist insurgency and chronic power shortages, has struggled to energise its economy in recent years. Growth has bumped along well below the level experts say is needed to absorb new entrants to the workforce from Pakistan's growing, youthful population. India's economic growth rate slowed down in the most recent quarter, according to official figures. The economy expanded at an annual rate of 4.7% in the three months to December, down from 4.8% in the previous quarter. The figure was lower than analysts had been expecting. Asia's third-largest economy has been weighed down by various factors, such as high inflation, a weak currency and a drop in foreign investment. For the same period in 2012, annual GDP growth was 4.5%. This is the fifth quarter in a row that India's annual growth rate has been below the 5% mark. Manufacturing was hardest hit - falling by 1.9% compared with the previous year. The industry is considered one of the country's biggest job creators. However, hotels, transport utilities and agriculture all showed substantial growth. "We continue to expect India's economic recovery to remain slow and uneven. Local conditions remain challenging, which is critical as the economy is driven primarily by domestic demand," said Capital Economics economist Miguel Chanco. Two years ago, India's growth rate stood at about 8%. Economists say the country needs to grow by that much in order to generate enough jobs for the 13 million people entering the workforce each year. The BBC's Yogita Limaye in Mumbai says the numbers are not good news for the ruling Congress Party, which faces elections in May. "These figures show that the slowdown really cemented itself in 2013. All four quarters showed growth below 5%," she said. "One silver lining [for the government] is inflation. Prices had risen steeply in the beginning of the year but over the past two months they have come down." More than half of the country's 1.2 billion people are under 25. Chand Pandey is one of them. He lost his job at a car parts firm recently and is struggling to find another one. "Whichever company I go to, they say there's a slowdown and there's less production," he said. "So they're not hiring any workers right now. It's been two or three months that I've been looking for a job, but I get the same answer everywhere." "Failed State" Pakistan recorded five per cent growth in the first quarter of the current fiscal year, the central bank said Friday, beating its target and almost doubling the figure for the same period last year. As the State Bank of Pakistan remains tightlipped over the source and purpose of funding, Pakistan received another tranche of $750 million in the newly-established Pakistan Development Fund (PDF), taking the total contribution to $1.5 billion so far. Highly-placed sources told The Express Tribune that friendly countries have injected another sum of $750 million in the PDF – an account opened to channel money from abroad. The last tranche was received in February that stabilised the dwindling official foreign currency reserves. It is the first time that any country has generously given $1.5-billion assistance to Pakistan within one month, as Islamabad never received such an amount as ‘upfront’ payments. The US, which remains the largest contributor, always gave amounts in tranches spreading over several years. Under its five-year, $7.5-billion Kerry Lugar aid package, Washington gave less than $2.5 billion in government-to-government assistance in over three years. However, it was not clear whether the money received is a grant or depositary loans aimed at temporarily bailing out the country. The officials, seeking anonymity, confirmed the receipts but none of the concerned government agencies came on the record. SBP chief spokesman Umar Siddiqui did not respond to queries regarding receipt of the $750-million second tranche. However, a statement issued by the Ministry of Finance, quoting Finance Minister Ishaq Dar, said, “The government of Pakistan has implemented concrete steps to improve the overall external position by ensuring substantial capital and financial inflows in the country. “As a result, reserves have improved substantially in the last one month. This has been made possible by not only receiving larger inflows from multilateral and bilateral resources; but also through attracting forex flows through the capital markets and better home remittances. Washington, April 9. 2014—The World Bank said today it was cautiously optimistic about economic prospects in South Asia in 2014 because of growing exports and investment as it emphasized that the risks to growth were becoming more domestic, including an increasingly vulnerable banking sector. In its twice-a-year “South Asia Economic Focus”, the World Bank forecast that economic growth would rise to 5.8% in 2015 from 5.2% this year and 4.8% last year. South Asian countries – which include Afghanistan, Bangladesh, Bhutan, India, Maldives, Nepal, Pakistan, and Sri Lanka – appeared to have largely recovered from last year’s financial turmoil caused by changes in US Federal Reserve monetary policy. Many were rebuilding currency reserves while curbing current account deficits. But these successes on the external side were accompanied by looming problems in the domestic economy. Economic growth could be held back by unstable banking sectors, inflation, fiscal deficits and debt, and persistent shortfalls in energy and transport infrastructure across the region. The region’s largest economy, India, would see growth rise to 5.7% in fiscal year (FY) 2014 from 4.8% last fiscal year with activity receiving a boost from a more competitive exchange rate and many large investment projects going ahead. Pakistan’s economic growth could increase to 4% this fiscal year from 3.6% in FY2013 as its economy benefitted from a reduction in electricity blackouts, resilient remittance flows from Pakistani workers abroad, rebounding manufacturing exports and a more buoyant services sector. Nepal was recovering from a difficult year affected by setbacks in the agricultural sector and with its government budget. Helped by strong remittance flows boosting consumption and the services sector, the economy should grow by 4.5% in FY2014 after 3.6% in FY2013. Sri Lanka would continue to grow at 7.3% this year as the economy was sustained by new capacity from infrastructure investments and rebuilding after the country’s recent conflict. Economic activities recovered in the second half of FY14 in Bangladesh, driven by resilient exports and domestic demand, following setbacks suffered in the first half due to political uncertainty and turmoil. A recovery in export growth and increases in public expenditure are likely to help achieve 5.4% GDP growth in FY14, slightly lower than last year’s 6%. The economy in Afghanistan will be weighed down by the persistent uncertainty caused by the withdrawal this year of international forces and the subsequent reduction in foreign aid for the economy. In addition, the country’s agricultural sector’s output has declined. Economic growth was therefore projected to fall to 3.2% this year after 3.6% in 2013. Depending on security and whether agriculture rebounds and mining output increases, Afghanistan could see growth recover in 2015 and 2016 to around five percent.